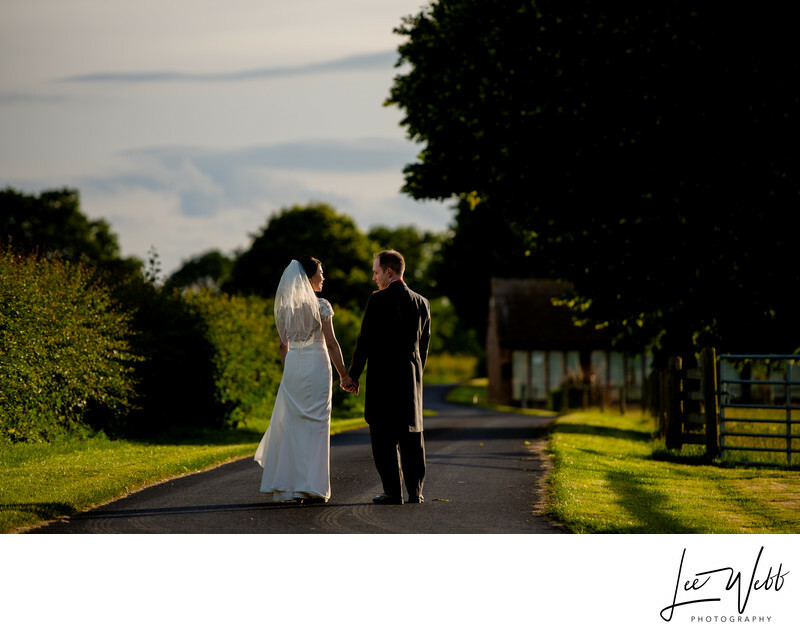 Peng and Ross held their wedding on the groom's family farm. The pair had always wanted to get married outside on their farm, but as the venue wasn't licensed for civil ceremonies, they tied the knot legally a week before in Worcester Registry Office. Having a do-it-yourself wedding is a fantastic way of putting a really personal touch on the day and the proceedings. You can literally have anything you want, and as the ceremony isn't legal you can also do pretty much whatever you want here too! This type of wedding is becoming a lot more popular in Worcestershire and I've experienced my fair share of this style of wedding. Peng and Ross's ceremony was held on the back lawn of the farm house. The ceremony was originally intended to be held completely outside, but closer to the wedding the groom decided that it might be best to provide their wedding guests with a little cover in the form of a marquee, should it rain - which it did. The rain finished after around 20 minutes, and was replaced with very bright sunshine. The light was harsh but I took some photos of the newlyweds anyway, with the idea being that if the rain holds off, we'd take some more couple's photos later in the day when the light was warmer and softer. It wasn't until just before the groom was due to give his speech that the light I had been wanting finally appeared. With the sun lower in the sky, the harshness had gone and there was a beautiful golden glow in the sky. The groom wasn't keen on posing for photos, so instead of making him feel unnecessarily uncomfortable in front of the lens, I placed them where the light was best, and the effect I was looking for most dramatic, and simply got the bride and groom to act as if I wasn't there. They shared a lovely, romantic moment with the groom kissing the bride on the cheek as she looked off over the countryside, and the resulting photos are absolutely timeless. With the light being just right, we took a few other photos in this location as I really liked how the dark green of the garden hedge was cast into an almost-black colour in the photos. 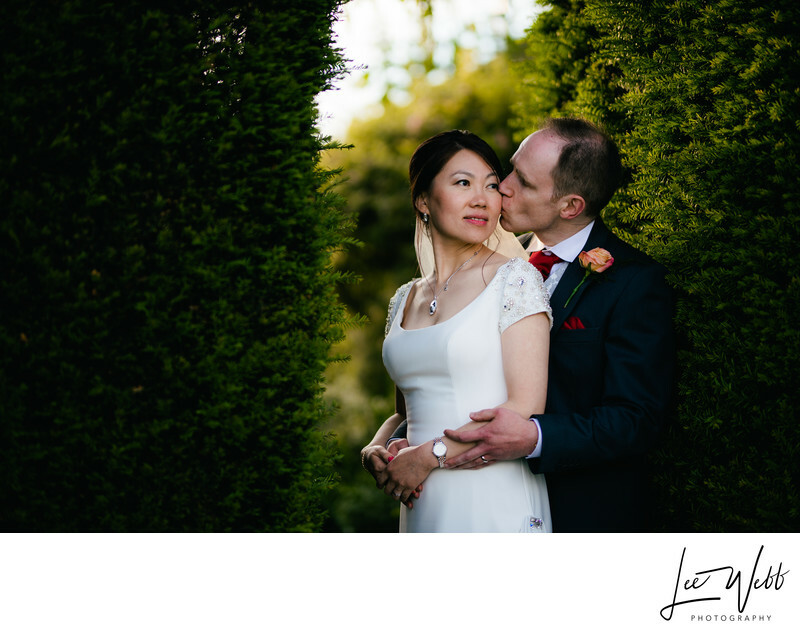 I really love the image above too, where I placed the bride and groom in the garden (on the same lawn that the wedding ceremony had happened hours earlier) and shot back through a small gap in the hedge where the path leads. I chose to shoot this image with my 85mm portrait lens, at f/1.4 as the wide aperture would render the foreground and background out of focus, allowing the viewer to naturally be drawn to the bride and groom in the centre of the image. With the light rapidly fading and the sun disappearing over the hills, we took a short walk to the front of the farm, to grab some photos on the main driveway. As the light source was so low, the shadows being cast were long, and the directional nature of the light gave a very high level of natural contrast. I asked the bride and groom to casually walk away from me, and stop after 25 metres or so. The light in this image could not be much better, with a beautiful rim-light catching both the groom, down his right side, and the bride too. The dark background means they stand out even more.